The RuMe Reveal is your new favorite travel companion! 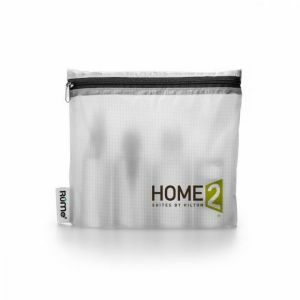 It's a TSA compliant toiletry pouch that's perfect for carrying liquids during air travel. This quart pouch is water-resistant to keep spills inside the bag and machine washable for cleaning up afterward. Made from semi-translucent, tear-resistant material, it features a zipper closure. NOTE: Full front decoration placement will not pass TSA compliance. Lower right corner placement decoration is TSA compliant. Travel size bottles are not included.